Big Data is a hot topic because it represents the first time in about 30 years that people are rethinking databases and data management. Literally, since about 1980 the enterprise database market has consolidated around 3 vendors – Oracle, IBM and Microsoft. So tremendous amount of innovation taking place around streaming databases, low latency OLTP, NoSQL, in-memory, columnar, or cloud databases. Hardware architectures have changed — people want to scale horizontally like Google. 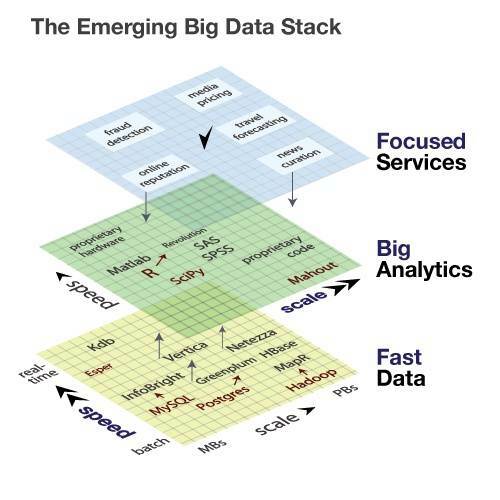 Innovation around Big Data is also happening on other fronts from the core (e.g., analytics and query optimization), to the practical (e.g., horizontal scaling), to the mundane (e.g., backup and recovery). So if you have not heard of these tools – Hadoop, NoSQL, MongoDB, Cassandra, HBase, Columnar databases, Data Appliances – then it’s time for a quick primer. NoSQL stands for Not Only SQL. NoSQL databases do not use the popular SQL (Structured Query Language) to create tables and insert, delete or update data. Many NoSQL deployments handle data that simply can’t be handled by a relational database, such as sparse data, text, and other forms of unstructured content. Unstructured content include social media/networks, Internet text and documents; call detail records, photography and video archives;; and web logs. Industry specific unstructured data include RFID; large scale eCommerce catalogs, sensor networks, astronomy, atmospheric science, genomics, biogeochemical, biological, and other complex and/or interdisciplinary scientific research; military surveillance; and medical records. Cassandra was developed by Facebook and later open sourced in 2008. Cassandra is influenced by the Google BigTable model, but also uses concepts from Amazon’s Dynamo distributed key-value store. Eventually, Cassandra became an Apache project. It falls under a category of databases called NoSQL, which stands for Not Only SQL. Cassandra database is used by Facebook, Digg and Twitter. Hbase – is NoSQL open-source, column-oriented store database modeled from Google’s BigTable system. Hbase is an Apache project. It is part of the Hadoop ecosystem. See this presentation on how FaceBook uses HBase in Production. Hadoop – Apache Hadoop is a popular open-source software framework for distributed/grid-computing environments that enable applications to analyze large data sets. Relational database systems are good at data retrieval and queries but don’t accept new data. Hadoop and other tools get around this and allow data ingestion at incredibly fast rates. Hadoop was built initially by Doug Cutting while he was at Yahoo, has become prominent first in unstructured data management and cloud computing. Hadoop is designed to process terabytes and even petabytes of unstructured and structured data. It breaks large workloads into smaller data blocks that are distributed across a cluster of commodity hardware for faster processing. But Hadoop requires additional programming tools such as Pig or Hive to write SQL-like queries to retrieve the data. Technically, Hadoop, a Java based framework, consists of two elements: reliable very large, low-cost data storage using the Hadoop Distributed File System (HDFS) and high-performance parallel/distributed data processing framework called MapReduce. HDFS is self-healing high-bandwidth clustered storage. Map-Reduce is essentially fault tolerant distributed computing. 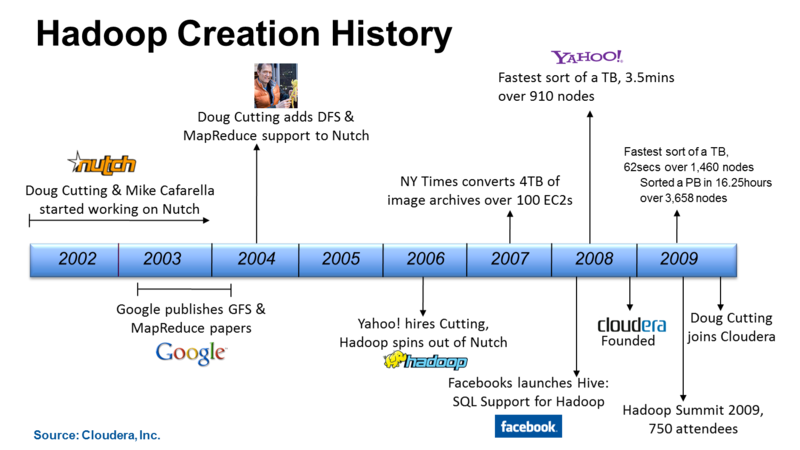 Hadoop builds on the MapReduce algorithm. MapReduce, first introduced by Google in 2004, consists of two functions – Map and Reduce. Map takes large computational problems, breaks them down into smaller subproblems and distributes those to worker nodes, which solve the problem and pass the answer back to the master node. The Reduce function consolidates the answers from the Map function to produce the final output. Search algorithms (public cloud) are often designed in this fashion. Hadoop runs on a collection/cluster of commodity, shared-nothing x86 servers. You can add or remove servers in a Hadoop cluster (sizes from 50, 100 to even 2000+ nodes) at will; the system detects and compensates for hardware or system problems on any server. Hadoop is self-healing. It can deliver data — and can run large-scale, high-performance processing batch jobs — in spite of system changes or failures. Columnar databases. Examples include SAP/Sybase IQ, HP/Vertica, and ParAccel. 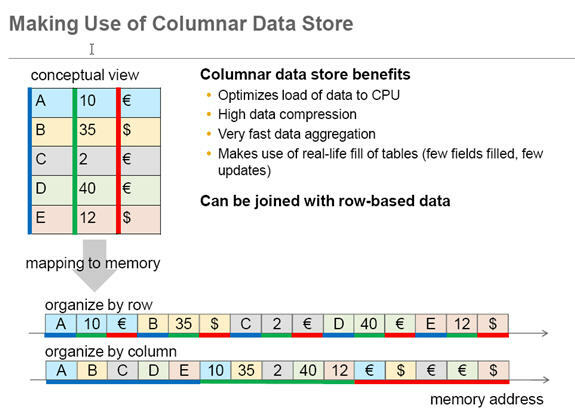 Columnar querying’s performance efficiencies are unmatched by any row-oriented database. Purpose built solutions like Teradata, IBM/Netezza, EMC/Greenplum, SAP HANA (High-Performance Analytic Appliance) and Oracle Exadata are forming a new category. A number of vendors are going down the path of appliance and quasi-appliance offerings which have some preconfiguration of hardware and software, cloud-supporting deployments, and reference configurations. A leading example is Oracle Exadata Database Machine. Exadata is Oracle‘s fast-selling appliance that bundles its database and hardware for optimized performance. Oracle Exadata deployments mostly involve replacing data warehousing solutions for much better performance via compression, and dropping overhead like old indexes and partitions. 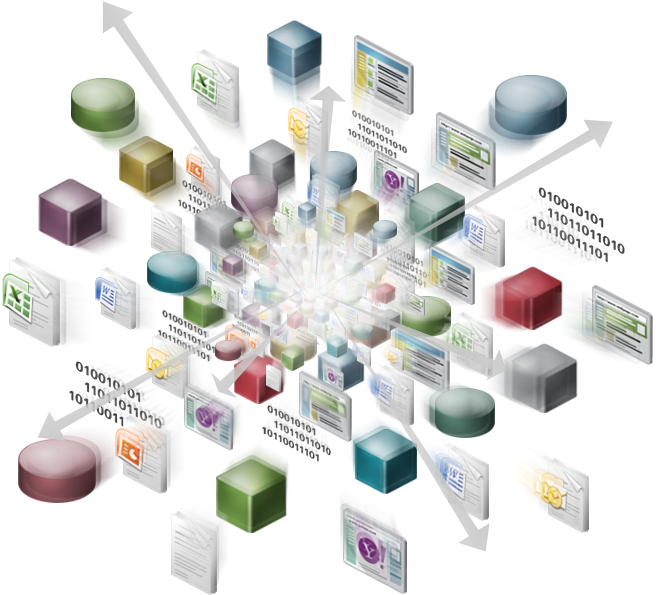 See Oracle Analytics-as-a-Service strategy for more indepth discussion. SAP HANA is an equivalent of Exadata and debuted at Sapphire 2011. 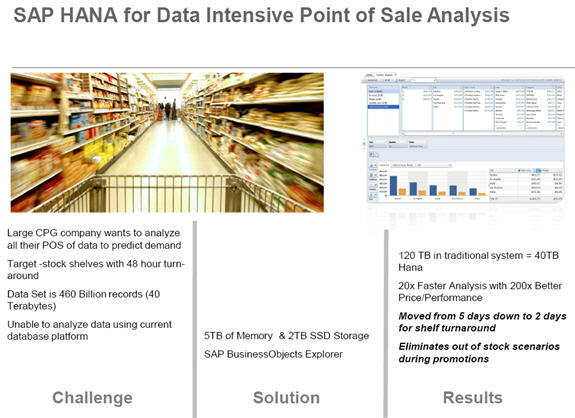 HANA is based on a fundamental computer science principle: when operating on large data sets and want fast response times, do not move data from disk unless absolutely necessary. Separate OLAP (BI data) and OLTP (transaction data). Have the OLAP in-memory and speed up the dashboards, reporting and analytics. MongoDB is an open source database, combining scalability, performance and ease of use, with traditional relational database features such as dynamic queries and indexes. It has become the leading NoSQL database choice, with downloads exceeding 100,000 per month. Thousands of customers including Fortune 500 enterprises and leading Web 2.0 companies are developing large-scale applications and performing real-time “Big Data” analytics with MongoDB. For more information, visit www.mongodb.org or www.10gen.com. 10gen develops MongoDB, and offers production support, training, and consulting for the database. There are many new database directions appearing on the landscape today. These include nonschematic DBMS ( “NoSQL”), cloud databases, highly distributed databases, small footprint DBMS, and in-memory database (IMDB). The business applications of these are driven by high performance, low latency and efficiency in deployment. All of these are driven by the premise that insight into data requires more than tabular analysis. Google in May 2011 open-sourced a BigTable-inspired key-value database library called LevelDB under a BSD license. It was created by Dean and Ghemawat of the BigTable project at Google. A recent blog post from Google made the project more widely known. It’s available for Unix based systems, Mac OS X, Windows, and Android. Recommendation engines — increase average order size by recommending complementary products based on predictive analysis for cross-selling. Cross-channel analytics — sales attribution, average order value, lifetime value (e.g., how many in-store purchases resulted from a particular recommendation, advertisement or promotion). Event analytics — what series of steps (golden path) led to a desired outcome (e.g., purchase, registration). Merchandizing and market basket analysis. Campaign management and customer loyalty programs. Fraud detection and security analytics. CRM and customer loyalty programs. Credit risk, scoring and analysis. Ad targeting, analysis, forecasting and optimization. Social graph analysis and profile segmentation. Campaign management and loyalty programs. Energy consumption and carbon footprint management. Campaign and sales program optimization. Patient care quality and program analysis. Drug discovery and development analysis. Revenue assurance and price optimization. Campaign management and customer loyalty. Call Detail Record (CDR) analysis. Smart meters in the utilities industry. The rollout of smart meters as part of the Smart Grid adoption by utilities everywhere has resulted in a deluge of data flowing at unprecedented levels. Most utilities are ill-prepared to analyze the data once the meters are turned on. As I speak to customers, it is becoming more clear to me that there is going to be growing push towards an elastic / adaptive infrastructure for data warehousing and analytics. With increasing focus on mobility and faster decision making…the business is going to push for this faster than Corporate IT can react. What’s next? That’s a simple question to ask, but it’s not so simple to answer. Big Data is a umbrella phrase for a set of technologies, skills, methods and processes, some new, some not for gaining insight from mountains of data. It is essentially the combination of the 3 V’s – volume, velocity and variety. the Enterprise IT roadmap is going to divide into a Compute Cloud AND Data Clouds. The Data Cloud (in-memory, data appliances) is being driven from mobility and decision making side.